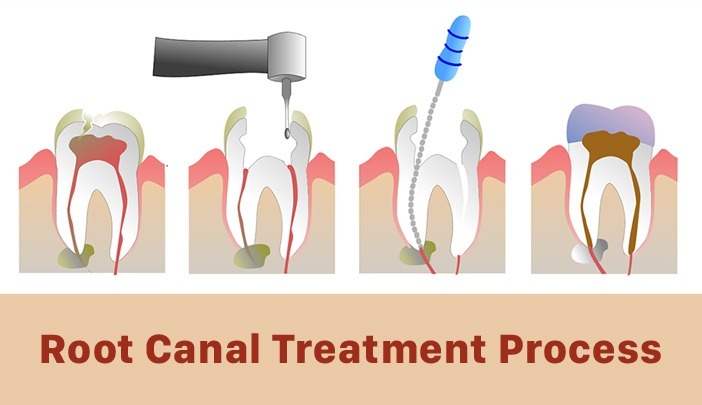 Root Canal is a dental procedure used to treat infected, inflamed or dead teeth. The core of every tooth is filled with a soft substance which is a combination of nerves, connective tissue, and blood vessels. If this pulp becomes infected, it can affect the health of the adjacent teeth as well. In many cases, the best way to fix this problem is to get a root canal done. When Would a Root Canal Be Recommended? You have excruciating pain in your tooth. If you experience sensitivity to cold and heat even when the stimuli are taken away from it. Your tooth has developed a severe abscess that is now affecting the pulp. In situations such as this, a pus pocket may form at the root end which can be very harmful. These are the different situations in which a root canal may be the best solution for you. At one point in time tooth extraction was the only solution in these types of problems. However, a root canal treatment now makes it possible to save the tooth and maintain the health and alignment of adjacent teeth as well. In this procedure, the infected pulp will be removed. The chamber that held the pulp, as well as the canals leading to it, would be filled with a special dental material with a medicinal base, and then sealed. This prevents bacteria from entering into the mouth. The treated tooth will then be protected using a dental crown. If you are facing any of the problems mentioned above, your dentist – Dr. Navarrete, will first conduct a detailed assessment of the affected tooth and the area around it. They will ascertain whether the damage is excessive and recommend an extraction only if necessary. In this case, the lost tooth would be replaced with either an implant or a partial denture. However, if the tooth is salvageable, your dentist may recommend that a root canal be done. For information on our Root Canals services in Hialeah Florida, feel free to contact Life Smile Dental by Dr. Navarrete at (305) 558-6832 or request an appointment via this page.